Ang Thong is one of the central provinces (changwat) of Thailand. The name means "golden bowl", an allusion to Ang Thongs agricultural importance. Neighboring provinces are (from north clockwise) are Sing Buri, Lopburi, Ayutthaya, and Suphanburi. Ang Thong native handicrafts include moulded court dolls, firebrick, and wickerwork. There are more than 200 temples in Ang Thong. Ang Thong occupies a low river plain, created by the Chao Phraya and the Noi Rivers. It has neither mountains nor forests, but consists of mostly agricultural land. The two rivers, together with many canals (khlongs), provide enough water for rice farming. Ang Thong was historically known as Wiset Chai Chan, on the Noi River. It was an important border town of the Ayutthaya Kingdom during the wars with Burma, as the Noi River served as a natural obstacle for advancing troops. During the reign of King Taksin after the fall of Ayutthaya, the main city of the province was moved to the Chao Phraya River, and named Ang Thong, as the Noi River had become silted and too shallow for transportation. The name Ang Thong means "gold basin", thought to have derived from the basin-like geography of the area, and the golden color of the rice grown in the region. Ang Thong is the provenance of Li Ke, the native folk song, and the hometown of Nai Dok and Nai Thongkaeo, two heroes during the Bang Rachan Battle. 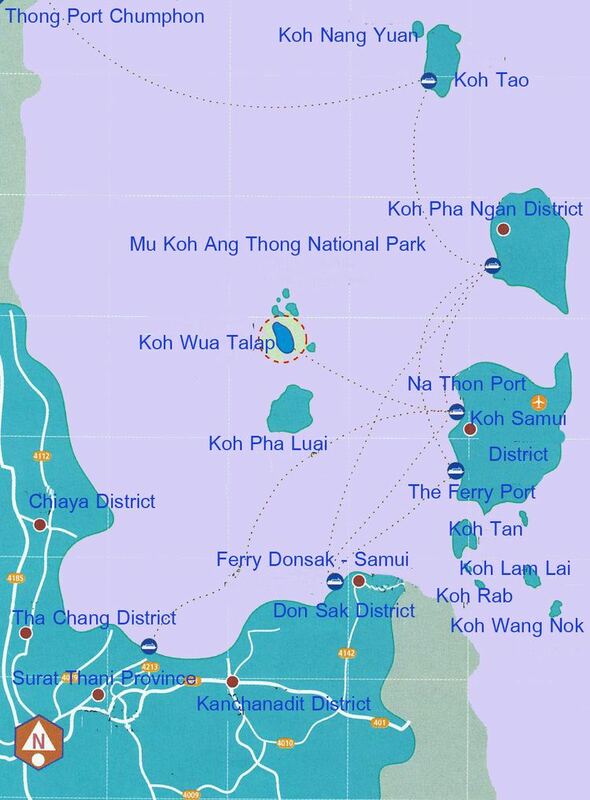 The name "Ang Thong" also refer to the Angthong Islands which are in the south. But Angthong province are in the middle part of Thailand and no connection to the sea. Wat Phinitthammasan: The main attractions of this temple are the old viharn constructed in the late Ayutthaya period, and the large seated Buddha image made of plaster, in the posture of subduing Mara, built in the first Chiang Saen batch with a lap width of approximately 12 metres, enshrined in the open. Wat Ratchapaksi (Nok): In this temple one finds a large reclining Buddha similar to the one enshrined in Wat Pa Mok, but of a slightly smaller size. The image was assumed to have been constructed during the Ayutthaya period. Wat Suwansewariyaram: The viharn of this temple houses a reclining Buddha image of approximately 20 metres in length. Wat Mathurotsatiyaram: This temple is assumed to have been constructed in the late Ayutthaya period. The only evidence remains are crystal wall, ubosoth, chedi and viharn standing on the appropriate positions with magnificent figures. Wat Chantharangsi: The temple site is located on both sides of a road. On one side there is a sacred Buddha image called "Luangpho Yok". On the other side is the viharn of Luangpho Sod which houses a Buddha image made from metal. This image is the largest of its kind in the world and was constructed in 1996. City Pillar Shrine: This is one of two city pillar shrines with murals on its interior walls. (The other city pillar shrine with murals is the City Pillar Shrine in Bangkok). Ang Thong City Pillar Shrine is an exquisitely sacred place appropriate as a focus of victory and people’s heart. Aquarium: Here one can find many large Amazon serpent-headed fish and also native fish like rad (gourami), sawai (genus Pangasius), thepo (genus Pangasius) and many more. Wat Ang Thong Worawihan: This is a third-class royal monastery opposite Ang Thong City Hall. The temple is famous for its beautiful ubosoth and bell-shaped chedi decorated with gold mirrors. Wat Tonson is an ancient temple housing Somdet Phra Si Mueangthong, a very beautiful seated Buddha image in the posture of subduing Mara. This is regarded as one of the largest metal moulded Buddha images. Thai-Style House Models, Thai-Style House Prefabricated Parts, Toddy Palm Furniture: This is a centre producing Thai-style house prefabricated parts of all types. The craftsmen inherited their sophisticated workmanship from their ancestors which conserving the unique Thai style. One can also find Thai-style house models and furniture made of several types of Toddy palm trees available for sale. Wat Plotsat: In this temple compound, there is a tower made of brick, whose unique summit is covered with Ceylon-style chedi pagoda. Somchit Roengpho Mixed Orchard: This orchard was given the Mixed Orchard and 2001 International Feminine Farmer Awards. Khun Somchit grows mixed fruits on a plot of 13 rai (5.2 acres) and rice on a plot of 10 rai. Wat Tha Sutthawat: This ancient temple was constructed in the early Ayutthaya period. At present, this temple is under the royal patronage of Princess Maha Chakri Sirindhorn. The temple compound is shaded with large trees and it offers a magnificent view of the Chao Phraya River. Ban Bang Sadet Court Doll Center is a high raised Thai house behind Wat Tha Sutthawat in Tambon Ban Bang Sadet. The establishment of Ban Bang Sadet Court Doll Project was initiated by Her Majesty the Queen in 1976. Its main purpose is to help the villagers earn a supplementary income. Wat Sa Kaeo: This temple has become a care center for orphans with many children under its supervision. Inside Wat Sa Kaeo, there is the "Samakkhisamakhan" building, which is a centre for hand woven fabrics project. It was established in 1981 as an initiative of Her Majesty the Queen and is currently under the supervision of Cottage Industry Section of the Ministry of Industry. Wat Pa Mok Worawihan: In the temple compound one finds a beautiful gilded reclining Buddha with a core of brick and plaster. Besides the reclining Buddha, this temple is famous for viharn Khian, where the wall facing the river features a tall stand formerly used by the King, a mondop with 4-foot (1.2 m) prints and a monastic library tower. Wat Thanon: This temple contains a slightly larger than life wooden Buddha image in the standing posture of approximately 2 meters tall. It is enshrined in the viharn called "Luangpho Phraphut Rampueng". People who pay homage to this temple, like to make wishes and prove them by placing the eggs in front of the Buddha image. Whoever can make the egg stand can expect good luck. Drum-Making Village: People of Ban Phae have begun producing drums since 1927. They are made after the harvesting season when work in the fields has finished. The raw materials used are cowhide and rain tree wood because its texture is soft and able to be dug easily. Ang Thong Brick is a high quality household industry for domestic sale. Most people use this kind of brick to decorate external parts of buildings and houses. Phanthai Norasing Monument: This monument was built in 1988 to commemorate the steersman of the Ekachai royal barge during the reign of King Phrachao Suea. The steersman confirmed to receive an execution for not having been able to control the barge well enough and letting it crash into branches, breaking the front of the royal barge. Wat Phohom (Wat Pahuaphan): Attractions in this temple are two large stucco images of four-faced Brahma heads, found during the excavation of this temple. They are placed on trays next to the chedi. The objects reveal the original workmanship of the Khmer-style sculpture. Wat Chaiyo Worawihan or Wat Ket Chaiyo: This is the second-class royal monastery. Inside the ubosoth, there are murals depicting scenes of the Lord Buddha’s chronicles painted by artisans during the reign of King Rama V, and the moulded statue of Somdet Phra Phutthachan (To Phromrangsi) from Thonburi. Wat Saket is an ancient temple, built in the Ayutthaya period. In the Royal Chronicle, it is mentioned that in 1585 when the king of Chiang Mai led his army to encamp at Ban Saket, King Naresuan the Great and Somdet Phra Ekathotsarot attacked and finally defeated the king of Chiangmai’s army. Wat Ta It: Villagers call the principal Buddha image in the ubosoth "Luangpho Phetch". The principal Buddha image in the viharn is called "Luangpho Khao". When entering the temple, the outstanding "Phrathat Chedi Sri Phothong" in gold can easily be seen. Wickerwork Village: The noted wickerwork area of the province is in "Ban Bangchaocha". Her Royal Highness Princess Maha Chakri Sirindhorn visited this village and advised people to grow Sisuk bamboo as their raw material and to conserve this type of handicraft. Bats at Wat Chantharam: The compound of this temple is crowded with trees. For many centuries already, it is the habitat of numerous bats. These bats look for food at night. During daytime, they hang upside down along the black-coloured branches and can be seen from a distance. Wat Khun Inthapramun: is located at Inthapramoon district. This temple has reclining Buddha that 2nd longest in Thailand. The Fine Arts Department registered Wat Khun Inthapramoon to historic in 1957. It is an ancient temple constructed during the Sukhothai period. Wat Pho Thong: In the Royal Chronicles, the temple of Wat Pho Thong was the place where Krommakhun Phornphinit (Prince Uthumphorn or Khunluang Hawat) entered his monk hood. King Rama VI spent his summer vacation in this temple during his boat trip visiting the Noi River and Yai River in Krungkao precinct in 1916. Phra Tamnak Khamyat: The 10x20 meters royal residence, made of brick and plaster, stands eminent in a paddy field. The artistic beauty still remains such as the motifs around the window. The front and back balcony are painted in red soil and covered with a wooden floor. At present, the Department of Fine Arts has renovated and registered Phra Tamnak Khamyat as a historical site. Fish Park at Wat Khoi: With the coordination from the Office of Amphoe Pho Thong Fisheries, this area was declared as a fish sanctuary. At present, there are various species of fish living together such as sawai (genus Pangasius), rad (gourami), thepo (genus Pangasius), buek (Pangasianodon gigas), tapian (carp) and many more. Bird Sanctuary: In this temple, thousands of birds of various species naturally dwell there including the egret, heron, open-billed stork, night heron, cormorant, kingfisher and many more. Certain species are nearly extinct and cannot easily be seen in elsewhere. Wat Ban Phran: There is a legend stating that the laterite Buddha image called "Luangpho Kraithong" which is enshrined in the viharn, was built by King Sri Intharathit of Sukhothai and removed into separated parts for reassembly as the principal Buddha image in Wat Ban Phran. Ban Khu Mueang: At Ban Khu Mueang, archaeologists discovered ruins of an ancient city, which presumably existed during the Dvaravati period. At present, it is a simple canal without any traces of historical sites. Wat Yang: The historical remains to be found now are an ubosoth with an upward curve base similar to junk ship, sandstone Buddha images, damaged stucco Buddha images and boundary stones. Wat Muang is located at Hua Taphan district along way Angthong-Wisat Chaichan, highway no. 3195 kilometers no.29. This temple has many landmark, such as the Buddhist temple which surrounded by a pink lotus largest in the world. Cathedral glass in 1st floor is a sacred object museum which open only Saturday-Sunday at 9 AM to 5 PM and 2nd floor has silver Buddha statue that only one in Thailand. Around the temple has statue shoring the god, heaven, hell in Thailand, and god of China. In backside of the temple has fish pond called " Wang Macha" and you can buy gift from Angthong. The Nai Dok Nai Thongkaeo Monument was constructed by Wiset Chai Chan together with the Ang Thong people to commemorate the two heroes of Ban Pho Thalay, Wiset Chai Chan people, and Grandpa Dok and Thongkaeo who sacrificed their lives in the battle with the Burmese at Ban Khai Bang Rachan prior to the defeat of Ayutthaya in 1766. Wat Khian: Inside the ubosoth are exquisite murals featuring stories of ten former incarnations of the Lord Buddha, which were presumably the workmanship of a school of painting from Mueang Wiset Chai Chan during the late Ayutthaya period. Wat Oi is an old temple representing a symbol of Mueang Wiset Chai Chan. In the precincts of Wat Oi, the Children Creation Foundation has provided accommodation for problem children: strays, drug addicts and those involved with other illegal behaviour. Wat Siroi The temple is situated at riverbank of Noi River, seeroy district, along highway no.3454 kilometers no 31-32. The name was presumably set up a memorial for Khun Rong Pladchu and 400 peoples that live in Wisat Chaichan. This temple has Buddha that called "Luang Pho To" or "Luang Pho Rong Hai" because in 1987 the Buddha has blood coming out from nose and eye. Addition, within the Buddhist temple has a mural of artisans from Ayuthaya but presently it fade out. Amphoe Samko: At present, Samko is well known for its local traditions and folk arts. There are some agricultural areas in Samko converted from rice fields for other agriculture usage such as lotus fields, coconut plantations and mixed orchards. Ngan Mueang U - Khao, U- Nam (City of Rice and Water Bowl Fair) and Annual Red Cross Fair is the annual fair of the Ang Thong people held after harvesting period in late December and the beginning of January every year. There are interesting activities like cultural shows, exhibitions, local handicraft sales, displays and demonstrations, stalls, the Mueang U-Khao U-Nam beauty contest, agricultural product contest, farmers’ sports competition and various other kinds of entertainment. The fair is held in front of Ang Thong City Hall. The Long Boat Race Festival at Wat Pa Mok is held within Wat Pa Mok Worawihan compound, Amphoe Pa Mok. The festival is held in 2 periods. The Prints celebration is held in March, while the traditional long boat race festival and the country’s renowned long boat competition is held in October. Paying Homage to Luangpho Wat Chaiyo: In this event, the worship and commemoration of Somdet Phra Phutthachan (To Phromrangsi) and Phra Maha Phutthapim is held in May and November of every year. Loy Krathong at Wat Siro: Every year there will be firework to celebrate Luangpho Pa Lelai. It is the sacred ceremony of the Ang Thong people and it is held on the same day as Loy Krathong day. The God Kuan-U Invitation and Dragon Parade Procession is held in December every year in Ang Thong market. It consists of a ceremony to invite God Kuan-U and a dragon parade procession.